Buy Blurry Photos a Coffee. ko-fi.com/blurryphotos - Ko-fi ❤️ Where creators get paid by fans, with a 'Buy Me a Coffee' button. 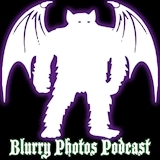 A podcast that explores the unexplained and explains the unexplored, Blurry Photos seeks the facts behind the fiction of the world’s most fascinating, unbelievable, and chilling mysteries and legends. Thanks for your support! I LOVE COFFEE! Secured Payments. Support goes to Blurry Photos's account. Upgrade Blurry Photos to a yearly Gold Membership with a one-time payment.